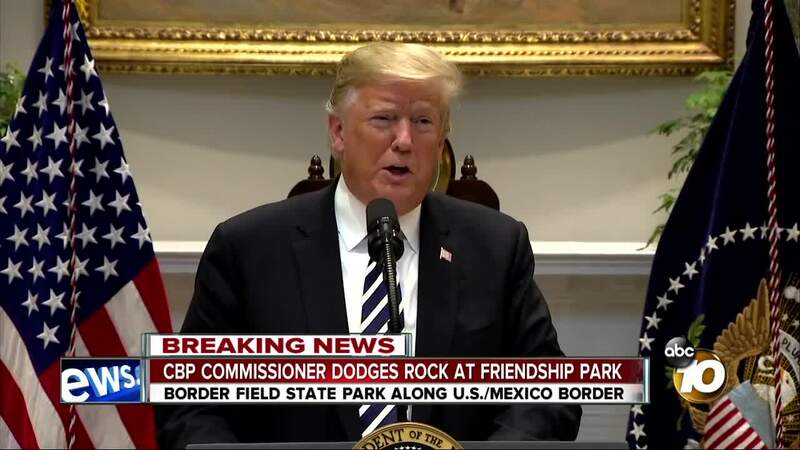 IMPERIAL BEACH, Calif. (KGTV) — The U.S. Customs and Border Protection Commissioner, Kevin McAleenan, was nearly clobbered with a large rock Friday night. According to CBP, McAleenan was taking a tour of the border defenses added to the wall along Friendship Park. He went to speak with people through the wall when someone threw a large rock from the other side and barely missed the commissioner. President Trump said earlier this month, that any rock and stone throwing would be considered firearms. CBP did not say what happened after the rock missed the commissioner, but said McAleenan took the rock with him. The incident comes the same day border officials released video of men climbing the U.S.-Mexico border fence and damaging recently installed concertina wire. Construction crews have been working throughout the week to reinforce fencing and other anti-climbing measures in an area behind La Americas Premium Outlets. Officials say that work began in June to replace 14 miles of aging fencing and not related to the arrival of a caravan of migrants from Central America.